The file av_sync_board.zip contains CAD files for an A/V sync and latency testing printed circuit board (PCB). The files include a fabrication drawing, EAGLE CAD, schematic, and BOM. See Audio Latency for recommended testing methods. 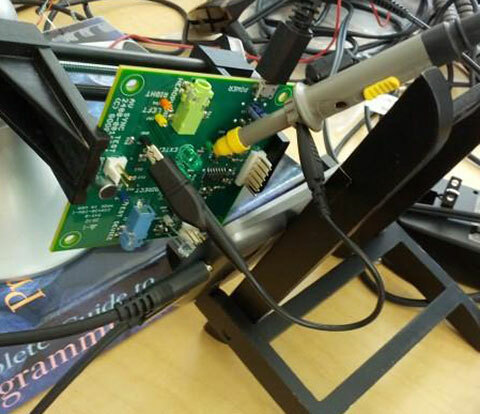 This PCB can be used to help measure the time between flashing the device's notification LED or screen backlight, vs. detecting an audio signal. 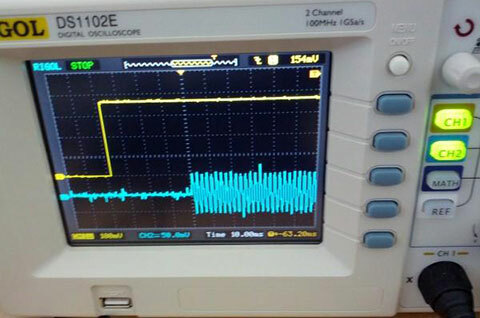 When combined with a dual-channel oscilloscope and suitable test app, it can show the difference in time between detecting the light and audio. That assumes the LED or backlight response time and light detector's response time are negligible relative to the audio. This design is supplied "as is", and we aren't be responsible for any errors in the design. But if you have any suggestions for improvement, please post to the android-porting group. Of course, this is not the only (or necessarily best) way to measure A/V sync and latency, and we would like to hear about your alternative methods, also at android-porting group. There are currently no compatibility requirements to use this particular PCB. We supply it to encourage your continued attention to audio performance. These photos show the circuit in action. This image shows the scope display for an unspecified device, software release, and test conditions; the results are not typical and cannot be used to extrapolate to other situations. 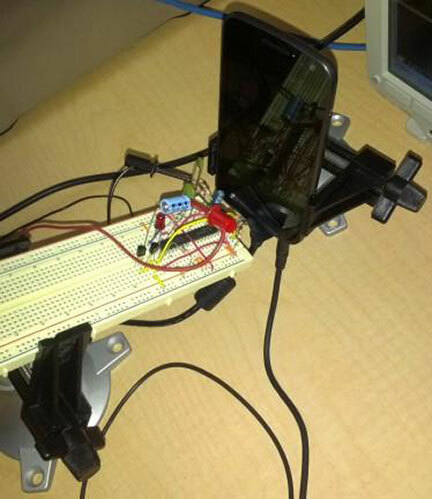 This Youtube video shows the breadboard version testing circuit in operation. Skip ahead to 1:00 to see the circuit.